A freshly-sharpened IBC Pinnacle A2 plane iron slices right through copier paper without any help, using the convex double bevel sharpening method. Update Aug 1: Corrected the title: Convex Double Bevel Sharpening! After I had made the video in part 1, I was reading a discussion on Woodnet about sharpening A2 steel. As usual there were strong feelings and opinions, but one of the things that came up was how to demonstrate the resulting sharpness. Obviously, the only thing that really counts is how well the iron or chisel cuts the wood, but even that's not easy to measure. There are a lot of variables, the type of wood, the grain pattern, how you setup the tool, how you hold it, how much force you apply, the quality of the resulting shaving. It's hard enough for the same person to evaluate sharpness consistently, how about different people with different skill levels trying to compare results? It's all highly subjective. Why care? Well, other than bragging rights ("I can shave the hair off a razorback hog at 20 paces"), you need to know when you're done sharpening and can get back to work. You need to be able to tell if the method is effective or not, and whether you might need to change something to get better results. This is especially true for beginners, who may not yet have enough experience to know what level of sharpness they can expect to achieve, or whether their results are consistent from one time to the next. I know that what I thought was sharp 2 years ago doesn't come near to what I can do now. 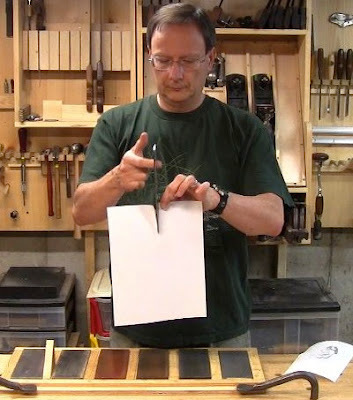 This is of course a huge can of worms and will remain unsettled forever, but Stu Tierney, who runs the Tools From Japan online store and blog, brought up the method of slicing through copier paper. I've seen this before, for instance Paul Sellers does it. You might regard it as a useless stunt, but I think it's useful because it's very visible on the macro level. You can easily see it work or not and see the resultant cut edge. It's also a lot of fun. Naturally, there are still variables. Copier paper varies in weight and quality, you can push the blade or slice with it, hold it at an angle. But at least from a given stack of paper, you can hold things consistently and apply the blade consistently to judge for yourself. When you can't make it work, you know for sure there's room for improvement. Once you pass that point where it does work, you can try and control those variables to see how easily it works. Do you have to give it a little push or a little slicing motion? Or will it cut without any help? I decided to try this with the convex double bevel sharpening method. In the video below, I go through the full sharpening sequence on my IBC Pinnacle A2 plane iron, with India stones, Arkansas stone, and strop. Then I hold the iron over the edge of the paper and let just its weight apply the cutting force. The results are quite satisfying. You'll notice a new source of music credited in the video. It's by Jason Shaw, who runs audionautix.com. There he provides downloadable music tracks he's created for any use, DRM-free, copyright-free, and royalty-free under Creative Commons license 3.0. It's perfect for people like me making hobby videos. Thanks, Jason! I am a recent convert to convex sharpening and find it great for chisels especially. It will be saving me time in the future. Thanks for the audionautix link, I have been wanting to find such music for some time.